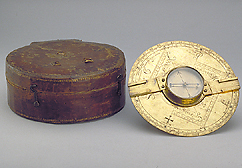 This simple theodolite, which is kept in its leather case when not in use, is adjusted to the horizontal by means of a universal ball joint fixed on the bottom. The outer scale of 360? has been re-numbered in half quadrants of 45?. The central shadow square is inscribed 'Puncta versa' in both normal and mirror script.